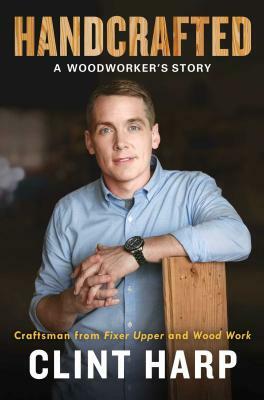 Clint Harp, maverick carpenter on HGTV’s smash hit Fixer Upper and the star of Wood Work on the DIY Network, presents his inspirational memoir that celebrates meaningful work, turning your craft into a career, and recognizing the importance of the journey itself. While Clint Harp is now known as Chip and Joanna Gaines’s go-to table maker on Fixer Upper and a nationally acclaimed artisan, his life has not always been the DIY dream we see on the show. Ten years ago, he played the role of what he thought was a good husband, father, and provider, dutifully working at a sales job that came with a healthy paycheck. Yet he kept coming back to his unfilled dream of building furniture. With the support of his wife, the encouragement of a mentor, and a life full of lessons, he finally took the leap, quit his job and set out on a quest to become a carpenter. Without formal training, financing, workspace, or customers, the Harps were quickly on the edge of financial collapse. Than Clint met Chip Gaines at a gas station—a chance encounter that marked the next chapter on a wild ride Clint and his wife, Kelly, wouldn’t have imagined possible. Spanning Clint’s remarkable journey—from a childhood learning carpentry and hard work at his grandfather’s knee, through his struggles to balance pursuing his dreams with supporting his family, to his partnership with Chip and Joanna Gaines and the many adventures and misadventures of filming Fixer Upper—Handcrafted is part memoir and part manual for dreamers. Clint provides unvarnished, thoughtful reflections on a path that is possible for anyone bold enough to pursue it. Clint Harp can be found regularly on HGTV’s hit show Fixer Upper as the dumpster-diving, reclaimed wood-loving carpenter and furniture artisan. He and his wife, Kelly, own and operate their business, Harp Design Co. The Harp family lives in Waco, Texas. Handcrafted is Clint’s first book.